The escape room craze has made its way to Orlando! 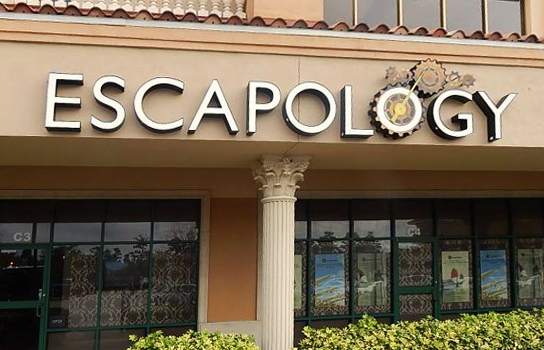 Opening Monday, Escapology is sure to become I-Drive’s newest “must-do” attraction. In a city where amusement is in no short supply, this is the type of experience that stands out. This is the type of attraction that you want to leave the theme parks for. Escape room attractions are a relatively new concept, and one that is growing popular in Orlando’s competitive amusement industry. But what exactly is the idea behind an escape room? Guests are locked into rooms along with well-hidden clues in the form of riddles, puzzles, and other mind-bending challenges. When discovered and solved, the scavenged clues pave the way for your great escape. Of course, there is a catch. In a cruel and chaotic twist, your successful escape has a time limit! Being a special preview event, I did not book my tour through the website. However, the online scheduling system appears very straightforward and easy to navigate. You simply select your experience, number of participants, date and time, make payment, and your game is reserved! 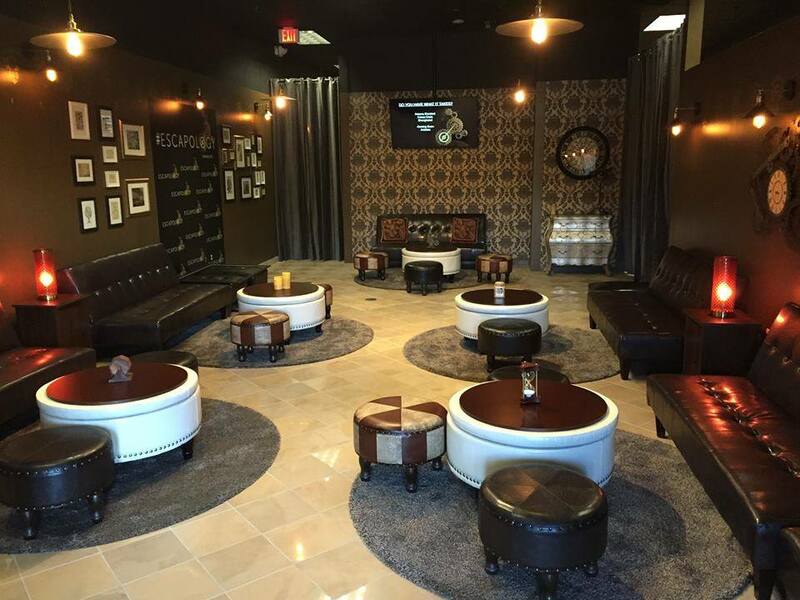 Currently, Escapology Orlando offers two uniquely themed experiences: Cuban Crisis and Shanghaied. Arizona Shootout and Antidote will soon be added to the game roster. When making my selection, I was warned that Shanghaied is a bit more challenging. Okay, Escapology… challenge accepted! Bring it on! We arrived a bit before our scheduled game time to explore the Escapology lobby. The decor is earth-toned Steampunkesque - very chic, and very inviting. We were signing forms acknowledging our consent to being locked in a room for one hour when our enthusiastic Game Master, Dianne, emerged to introduce herself and explain the mission we’d soon set sail on. As the Shanghaied story goes, we had been forced into servitude on the massive Chinese ship, The Keying! After a storm sends the ship to an island port seeking shelter, we have a small window of opportunity to escape before returning to sea - but only if we can find and solve the clues before time runs out! A few quick rules to clarify before our game, with the big one being no photography or video at any time. As someone who seems to always be snapping photos, this was a tough one, but it really is a necessity to keep the quality of the experience fair and fun for all. A simple photo of the room or anything within it risks spilling secrets that would certainly ruin the game for future players. A white board is provided in the room for taking notes. Clues can be anywhere - except under or behind heavy furniture. If an emergency arises and a member of your party needs to leave the room, you can signal your Game Master for assistance. The Game Master assigned to your team keeps constant watch over your experience through video monitoring. They are right outside the door at all times, and checking in on you periodically. Your Game Master can also provide you with helpful hints along the way, if needed, but use these carefully because your hints are tallied up with your final score! Dianne led us down a hallway to the room that would be our home for up to one hour. Just inside the room, a lock box serves as a secure spot to store phones and other small devices during game play. The lock box was too small to hold my camera, so after a little reminder that Dianne was always watching, I was allowed to leave it out, but on top of the box. With a wish of good luck, Dianne was gone, locking the door behind her. For about 30 seconds, the four of us looked at each other blankly before shifting our sights on scanning the room. Drawers, a trunk, a barrel, and shelves lined with distracting adornments - this is what we had to work with. But, some of those adornments weren’t simply distractions, and some of those compartments were locked! In a flurry of activity, we bustled around the room and gathered our found treasures into a central location for analysis. And there we stood, looking at a pile of completely random items that made no sense at all. Thanks to our stunned silence, I could only focus on the ambient sounds of the sea and the busy (but actually nonexistent) ship’s crew up above our seaworthy cell. Enter Dianne, who was now more of a savior than a Game Master. After complimenting out fast finds, she made the very welcome offer of a hint to get us going. None of us hesitated in our unanimous acceptance. She offered up a hint that had been considered one of the toughest clues to crack when she played, and as much as it helped us, it also scared me. I had no faith that we would have figured that one out on our own, and I feared the next step, but it was just the nudge we needed to progress. After a few more items came together, and a couple of locks were cracked, we all began to feel a bit more confident. There was one contraption in the room that I firmly believe only existed to drive people insane, and that item became the subject of a “free” tip from Dianne later on. Piecing together an almost laughable bundle of odds and ends, we eventually unlocked a door, and I was in disbelief thinking we were free in record time. No such luck! It was just another room with even more clues. The more we discovered, the more random it all seemed to be - until it all suddenly started making sense in a way that made no sense at all. As I heard the clock announcing that we had 20 minutes remaining, I took a brief moment to pause and ponder. I forgot the clues I had selected to decipher for just a moment as I took notice of my family. Each person was busily working on a set of clues. Without even discussing it, we had all gravitated toward solving puzzles that were aligned with our individual skills and knowledge. As the clock ticked on, I could feel just how close we were, and with the discovery of that last key, we all bolted for the door with pride to make our final escape. We emerged to cheers and applause from Dianne and her fellow Game Masters, with almost nine minutes remaining on the clock. We were even treated to complimentary champagne to celebrate our success! Apparently, this was an impressive time for escaping Shanghaied. Dianne credited our success to our ability to work together as a team. A little hint to future Escapologists - this is the single most important element to your escape! Speaking of teamwork, Escapology also offers an innovative approach to private parties and corporate team-building events. Up to 36 people may take part in Escapology’s group event structure, where the entire facility (complete with a professional conference room) and staff are at your disposal. “Corporate Mornings” run from 9AM until noon, with standard games opening for public booking from 1PM - 9PM, seven days a week. Pricing for Escapology varies depending on the number of players in your team. Teams may consist of 2 - 5 people, priced at $24-$30 each, with discounts offered to Florida residents, senior citizens, students, children under 18, and members of the military. 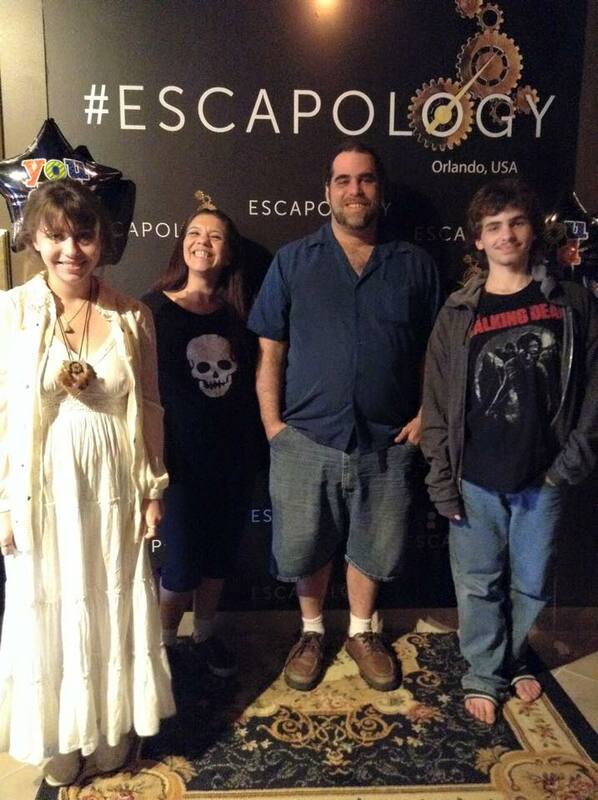 Escapology is fun for all ages, but best suited to guests over 7 years old. My family poses a unique challenge to any amusement place as we are not universally the easiest to please. It always seems that someone leaves feeling less than impressed whenever we attempt to try anything new. I cannot remember the last time we all appreciated an experience, and eagerly anticipated a return visit. Even more impressive is the fact that we enjoyed ourselves while sharing in a sincerely original bonding opportunity. When we left Escapology, we all felt a bit closer - and perhaps, a bit smarter. For more information on Escapology, visit their website.